The Colgate Total Website is using interactive video to explain oral health as a part of their new brand campaign. Guided by a voice over and video, users can take the ‘How Healthy is Your Mouth’ Test at the Virtual Clinic and get related Dental Advice for common oral health issues. The Virtual Expert provides detailed answers to Dental Health FAQs. 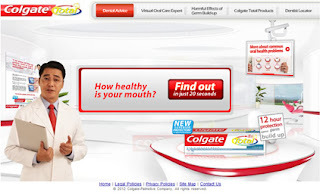 The site also lists out the usual Colgate Total products, benefits, how it works, television commercials and has a Dentist Locator that works quite well. The depth of information on the site and the way the application flows makes it a better user experience than boring health gyaan in endless copy that similar product websites tend to dole out. Of course there is a lot more that can be done locally (if I am not mistaken, the video application looks like a hand-me-down from an international market). In addition to enhancing the quality of the local pages on the site, social connect and contextual integrations with sites that provide related content but have higher reach immediately come to mind as possible future executions.